Office for iPhone has hit the App Store, meaning that Office 365-subscribing iPhone users can now create, read and edit documents on the go. 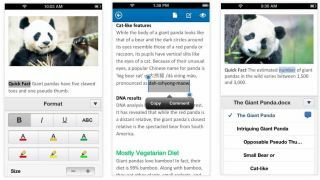 The mobile version of the Windows document editing suite comes with Powerpoint, Excel and Word on board, and offers an experience that Microsoft describes as "similar" to Office Mobile for Windows Phone. There's no OneNote or Outlook included in the suite though; OneNote is already available as a standalone iPhone app, while Outlook Mobile is exclusive to Windows Phone. You'll just have to make do with Exchange ActiveSync and the existing Mail app, email fans. It promises that formatting of documents won't get messed up despite the app optimising everything for the smaller screen, and promises built-in sharing (although this seems to amount to not much more than email and SkyDrive access). No word on whether or not we should expect an imminent release of Office Mobile for iPad, unfortunately - Microsoft recommends that you use Office Web Apps on your iPad for now, or you can scale up the iPhone app if you really, really want to. What's more, today's Office for iPhone release is only news for US iPhone-owning Office 365 subscribers, although Microsoft promises that the international roll-out should happen occur over four-to-five days.